I've been tweeting the AFT Convention for a few days. My style when I tweet things is to report what I hear. If I have any sort of commentary, I make it clear or do it here. Now that's fine, but Mulgrew himself doesn't use hashtags. He isn't on Twitter. He isn't on Facebook. In fact, he doesn't even answer email. If I want to send Mulgrew an email, I cross-post it to the blog because that way I know at least someone will read it. He then discussed organization. I listened intently because I'm very interested in organizing. He basically said that if you showed people you shared their interests they would become more involved. 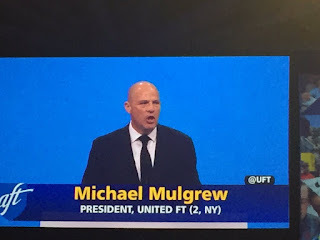 He showed pictures of the UFT bus with a bunch of new teachers in front of it. Being empowered doesn't mean yelling loudest about the thing you're mad about. I wasn't sure who he was talking about. Was it us? Was it BAMN, whose elected leader had been tossed out? They were pretty upset with Randi, and repeatedly blamed her for this happening. But here's the question I left that talk with--what exactly does Mulgrew do to engage members? We are the most active members there are, and they spend an awful lot of time building brick walls to keep us out. It's one of the most unproductive and stupid practices I've seen in my entire life. 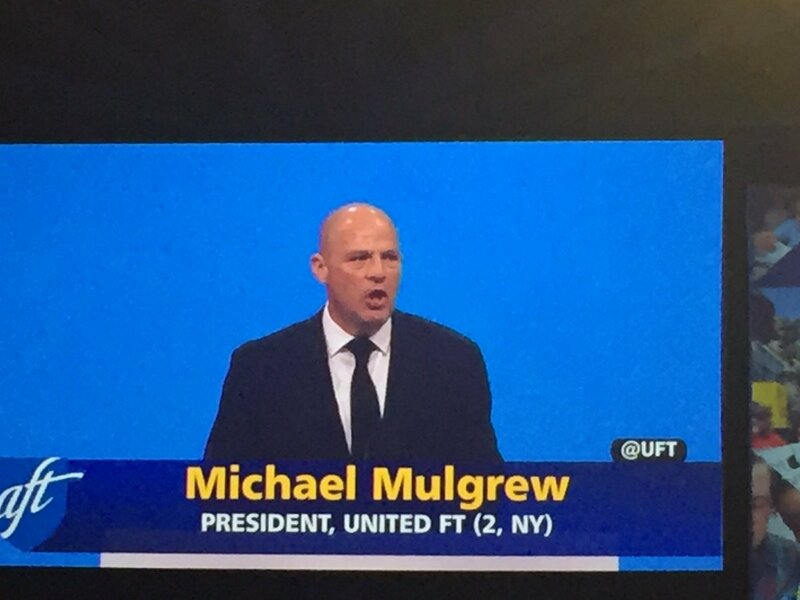 We know that everyone here in UFT, by far the most dominant force in the hall, signs a loyalty oath and votes any damn way he tells them. That's why they are here on our dime. We know that not one single person the high school teachers selected has a voice or a vote in this place. Do you want to organize? Give us a voice. Or don't, and we'll organize to get one. I'm ready to organize. I'm ready to engage the members right now. I'm gonna need something more than a picture of Mulgrew standing in front of a van with a bunch of teachers, though.